The horse holds a special place in the world for its grace, strength, and intelligence. 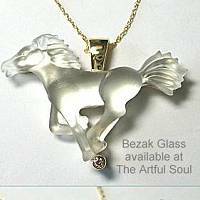 From the magnificent sport of horse racing, to the practical duties on a ranch, there are many reasons to wear jewelry with ponies in the design, carry handbags with a western theme, and give a gift with a horse motif. A horse head is carved from RUST AGATE, a really pretty dark mauve/rust color. Measures 1-1/2 inches across set in sterling silver. Suspended from 2 strands of 8mm FACETED FRESHWATER PEARLS that are a champagne bronze color, the facets offer a hint of sparkle, many have luster glow. 17 inches long, 1.5 inch extender chain. Tiny woven details in this extraordinarily light and fun bubblegum pink earring. It is woven with natural horsehair (dyed of course). Employing Rari basketry technique known for a delicate and fragile look. 2-1/4 inches across, hangs 2-3/8 inches long on earwire. We found these at an artisan village in Santiago, Chile. 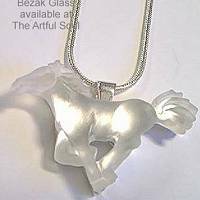 1-5/8 inches long including sterling earwire and legs, the cave-drawing inspired horses are polished pewter with embossed details and soldered brass. Black brush tail just outward, small stone accent at top (may be different than stone shown in photo). 1-5/8 inches long on surgical earwires, 7/8 x 3/8 inch rectangular stainless silver case has clear resin encasing the design. The artwork depicts white horse on golden brown background. Lightweight too! Tiny woven details in this extraordinarily light and fun golden corn yellow earring. It is woven with natural horsehair (dyed of course). Employing Rari basketry technique known for a delicate and fragile look. 2-1/4 inches across, hangs 2-3/8 inches long on earwire. Hard shell inner construction, antique brass frame opens from hinged base, and closes with secure clasp on the top that is finished with black crystal. Measures 7-1/2 x 5-1/2 x 3-1/2 inches. Covered in soft black padded leather and bronze leather strip around the edges. On one side is horse's head applique that is beaded in gold, white, brown and mustard beads, set upon cranberry red hair-on hide, and framed in chocolate beadwork. A tassel of leather and beads drips from the bottom. On the other side is black woven fabric with embroidered cowbow on horseback scene, also framed in chocolate beads. Has detachable antiqued brass shoulder chain (that also tucks inside for use as clutch). Interior lined in black fabric with small open pocket. Rearing horse in polished pewter with embossed patterns and brass soldered accents. Horse hair tail, pin measures about 2 x 1-5/8 inches, barpin clasp. 3-1/2 inches long (excluding key ring). Clear synthetic pony with painted white stripes, dangles with clear beaded loops, golden stars. Invaluable purse accessory...the silvertone ornament hangs on the outside of your bag, your keys clipped on the other end will hang on the inside!